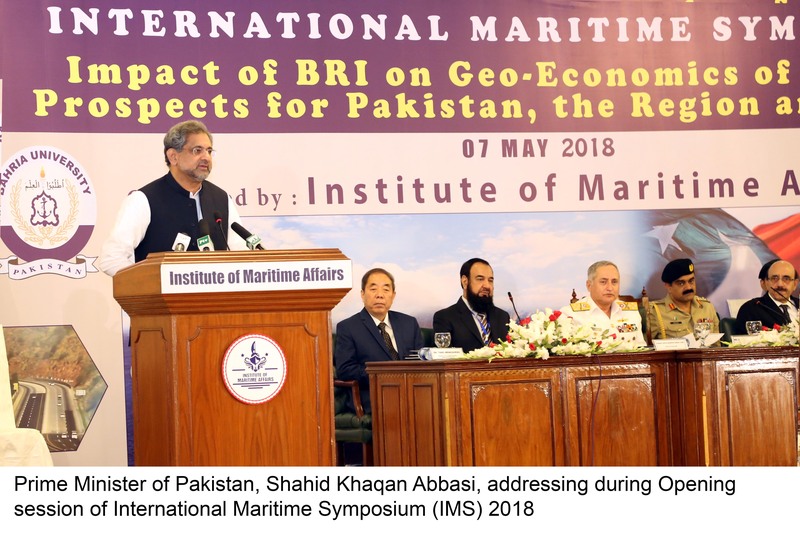 STAFF REPORT: Institute of Maritime Affairs (IMA) Bahria University, Islamabad, organised the International Maritime Symposium (IMS-2018) in the capital on “Impact of BRI on the Geo-economics of the Indian Ocean Region (IOR): Prospects for Pakistan, the Region and Beyond”. Prime Minister (PM) Shahid Khaqan Abbasi was the chief guest on the occasion. In his address, the prime said in reference to the importance of IOR that the global blue economy footprint showed that a major global trade share came from this region. Given the importance of the Indian Ocean and significance of globalisation, we acknowledge and appreciate the vision of Chinese President Xi Jinping for conceptualising and announcing the Belt and Road Initiative (BRI) with the economic objectives of connectivity, unimpeded trade, and financial integration, he added. The potential scope of BRI projects was vast and its financial scale was huge, the PM said. We have to optimise our share in BRI through China-Pakistan Economic Corridor (CPEC) and for this, Gwadar Port would play an all-important role, he added. Furthermore, PM Abbasi also highlighted the enhanced regional economic activity arising from BRI and said this would have a positive impact on the region and beyond. “We are working hard on strategising measures to ensure that both Chabahar and Gwadar ports were utilised as sister ports, so as to diversify and manage the huge potential of CPEC and BRI,” he added. More importantly, the regional countries could pursue economic initiatives in Afghanistan for prosperity and socio-economic development to ameliorate the trends of extremism and terrorism, he said. This would be a win-win situation for the region and the world at large, he added. He also commended the role of the armed forces of Pakistan in general and Pakistan Navy in particular for their initiatives to ensure maritime security of the country, especially the security of CPEC and Gwadar port. In his inaugural address, Chief of the Naval Staff Admiral Zafar Mahmood Abbasi NI (M) in his inaugural address said that the subject was deep-rooted in the remarkable trade history of the region which had transcended various races, cultures and religions. In the 21st century, the conceived ‘Economic Networking’ through BRI would not only help to revive historical links but also contribute towards economic prosperity of the countries that had renewed transcontinental trade routes connecting Asia, Africa, Europe and beyond.